Serbia's greatest sportsman has received Serbia's greatest sports honor. When the nation's delegation enters Olympic Stadium in London on July 27, world No. 1 Novak Djokovic will be at the front carrying the red, blue and white flag. He shared the news with reporters this week while preparing for his French Open semifinal against Roger Federer. "We are all very excited about the Olympic games in London, such a magnificent sporting event, and it goes without saying what a great honor it is for me to carry the flag for Serbia," Djokovic told AFP. Two tennis players carried the flag for their countries in 2008. Both Roger Federer and Fernando Gonzalez came away with medals. Djokovic won a bronze medal at those Games, defeating James Blake in the third-place match. "To win any medal in the Olympics is a huge achievement for any athlete. Not many athletes get a chance to win a medal," Djokovic said at the time. "But for me, this bronze shines like a gold because I think I've played pretty good tennis throughout the tournament." 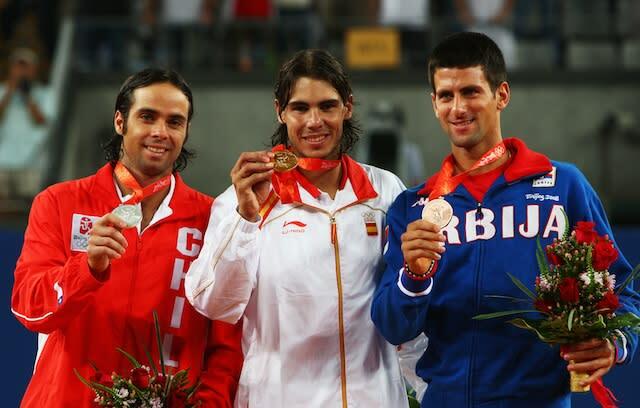 I doubt Djokovic will agree that any medal in the upcoming Games will shine like gold. For the first time since tennis' reintroduction to the Games in 1988, there's a legitimate buzz around this year's competition, mainly due to the historic venue at which the Olympics will be played.